Sami Ghandour, a forward on Concordia’s men’s basketball team has been around the sport his entire life. Born in Fergus, Ontario, a small town just north of Toronto, Ghandour and his family moved south to Arizona when he was just a year old. In the third grade, he began playing basketball. At the age of 13, his father, originally from Lebanon, moved the family to his birthplace. It was there where Sami had the opportunity to play basketball at the international level. He played for Sporting Al Riyadi Beirut, and from there he was recruited to try out for Lebanon’s national team. Ghandour said the team recruited top players from each club. He was fortunate enough to be asked to try out. Out of 200 players they kept making cuts and eventually, Ghandour made the team. In 2016, as a member of the under-19 national team he made the starting lineup. He led the team in minutes during his last tournament with the team. He totalled 61 points through eight games, with an average of 7.6 points per game. “It was a once in a lifetime experience to be able to represent my country in the sport I love,” he said. When it came time for Ghandour to choose a university, he opted for Concordia. The 6’6, 198 lb forward knew he wanted to study outside of Lebanon, and his Canadian roots made the choice that much easier. Ghandour is currently majoring in finance at the John Molson School of Business. He hopes to become a financial analyst once he graduates. Concordia is among the few universities that allow students to acquire this accreditation while earning their MBA. His brother had previously visited the campus and learned about JMSB, and he recommended the school to Sami. Surprisingly, basketball wasn’t always in his plans for university. “I came to Concordia at first for academics, and I was going to stop playing basketball until I saw that they had an excellent basketball program, which was a plus for me,” said Ghandour. 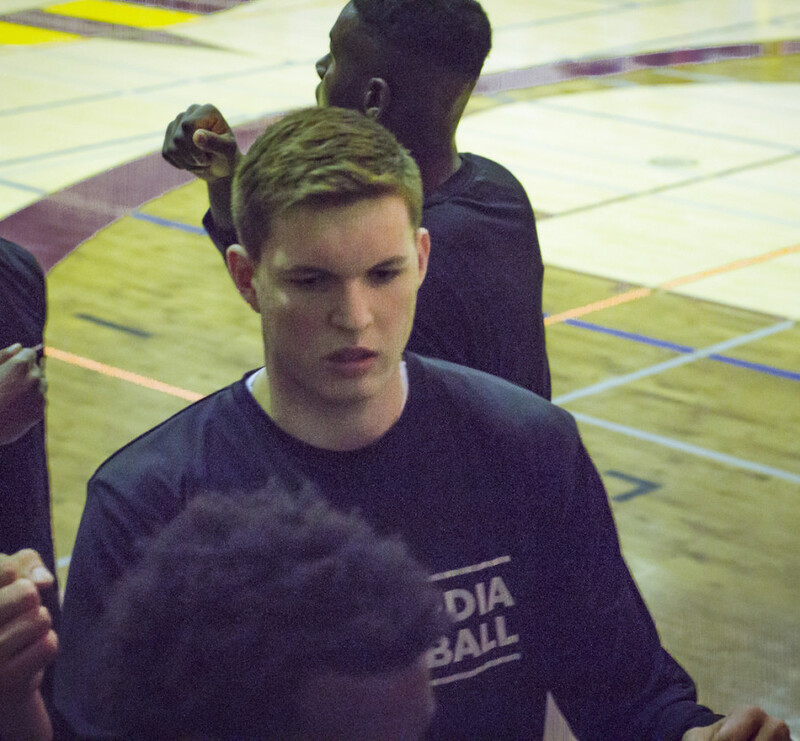 He sent Concordia head coach Rastko Popovic a highlight tape attached to an email. Popovic invited Ghandour to try out and he made the team. One adjustment he’s had to make is to the physicality of the game at the the Réseau du sport étudiant du Québec level. “When he arrived he was 18, the game is completely different and it’s a lot more physical. It was a big adjustment for him initially,” said Popovic. “I think last year, the first three or four months for him was a learning experience about the game. Although he didn’t play much last season at Concordia, a summer’s worth of work has put him miles ahead of where he was last year. “Last year, I was the youngest kid, I guess the runt of the team, and I just wasn’t ready to play yet,” said Ghandour. “Coach and I had a talk at the end of the season, he said ‘why don’t you come in this summer and work on your skills’ and so I bought in and I worked hard and it’s paid off. “I got my minutes, and I feel like I’ve done well,” said Ghandour. As for what role he’ll play this upcoming season, Popovic envisions Sami as a power forward. Popovic believes that Ghandour’s work ethic combined with his attitude will help him to develop as an athlete, making him a stronger player in the future. While it’s clear that Sami is here to stay as a Stinger, would he ever be interested in returning to Team Lebanon in the future? “Eventually I will try to play for the senior team. Probably not anytime soon, but if they ever ask me to, I’ll be happy to return,” says Ghandour.